Schmincke Series 12 Gouache is not to be mistaken with all those "designer gouaches" on the market that often alter their colors by adding white. Series 12 is a true artists' quality gouache which contains pure traditional lightfast artists' pigments as well as some brilliant modern pigments. 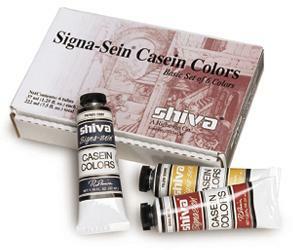 Schmincke Gouache is different from other gouaches in that the natural opacity of the pigments is not artificially increased as it is usually done with other designers' colors.